"The Third Congressional District in Maine comprises the five eastern counties - Aroostook, Penobscot, Piscataquis, Hancock, and Washington. Of these five, Washington is the only one which has not furnished a congressman in this century. 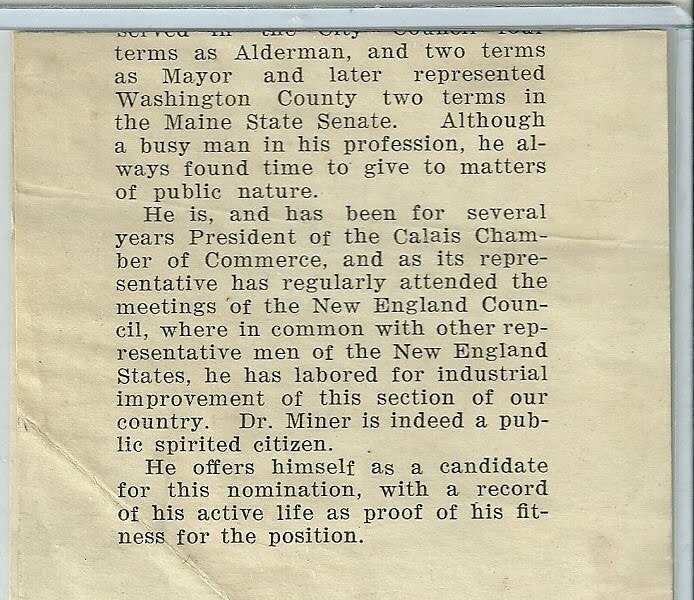 "The people of this most eastern county believe it is their turn to be represented in Washington by one of their own citizens, and will have a candidate for the Republican nomination in the June primaries in the person of Dr. Walter N. Miner of Calais. "They solicit support for him by the voters of the District first, because they are in all fairness entitled to furnish the candidate and especially because the candidate they offer is so well qualified for the position. "Dr. Miner has been a physician and surgeon in Calais for forty years. He established the operated the Calais Hospital, which recently has become a publicly owned community hospital, but he continues to serve as treasurer and manager. He has served in the City Council four terms as Alderman, and two terms as Mayor and later represented Washington County two terms in the Maine State Senate. Although a busy man in his profession, he always found time to give to matters of public nature. 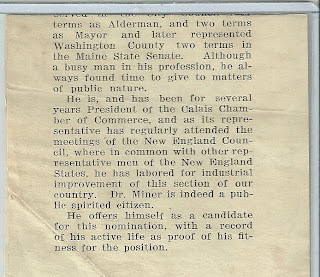 "He is, and has been for several years President of the Calais Chamber of Commerce, and as its representative has regularly attended the meetings of the New England Council, where in common with other representative men of the New England States, he has laborer for industrial improvement of this section of our country. Dr. Miner is indeed a public spirited citizen. "He offers himself as a candidate for this nomination, with a record of his active life as proof of his fitness for the position." Walter Nathan Miner was born in Mount Whatley, New Brunswick, Canada on 13 July 1872, the son of Nathan D. and Celia (Carter) Miner. He received his education at Fredericton Normal School, Fredericton, New Brunswick, Canada, after which he taught for three years, before deciding to pursue a career in medicine. He graduated from Baltimore Medical College, undertook postgraduate training in Baltimore, London and Edinburgh, and started a practice in Calais, Maine. In 1917 he started a thirty bed private hospital, which eventually became the community hospital now known as Calais Regional Hospital. Dr. Miner also practiced medicine across the St. Croix River from Calais at St. Stephen, New Brunswick. He had an active civic life in the Calais area. His son, John Walter Miner, also became a doctor. Dr. Miner married Estella Delahay in Maryland in 1903. She was the daughter of James Edward and Martha (Amos) Delahay of Maryland and California. Dr. Miner and Estella raised a son, John Walter Miner, and two daughters, Elizabeth Delahay Miner and Ruth Estella Miner. I hope you've enjoyed this memento. Thanks for stopping by!